Teichenné, the discerning bartender’s choice, has unveiled its elegant new look to launch the versatile liqueur into 2018. Available in seven striking flavours; Peach, Green Apple, Vanilla, Chocolate, Butterscotch, Strawberry, and Raspberry, the sleek, frosted bottles have been designed in collaboration with some of the world’s top mixologists to stand out on the back of bars and ensure ease of use in busy venues. Speaking of the bottles, Marc Teichenné, General Director, says: “Teichenne is perfect for creating old classic cocktails as well as exciting new serves. We created this liqueur with premium tastes in mind, using the richest ingredients to help it bring to life some of the finest cocktails around the world. And this is why Teichenné really is the discerning bartender’s choice. With a smaller base to take up less room on back bars and in speed rails, the bottles also have a longer neck which not only makes them prominent to the consumer but also provides a better, larger space for gripping and pouring for bartenders. Standing at 17% ABV, the liqueur is incredibly adaptable; not only does it act as a unique ingredient by adding unparalleled natural flavour, but it also provides an additional alcoholic element that never alters the colour of the cocktail due to the natural clarity of the liquid. Exclusively available in the on trade, the seven flavours will provide bartenders in some of the world’s finest bars and restaurants with unlimited options for creating unique cocktails and popular wine serves. Cocktail culture has taken the on trade spirits market by storm over the last few years; cocktails are forecast to account for 10% of all on trade spirit sales by 2020. As a result, spirits are currently growing in value (+3%), while liqueurs are now worth £800m, growing +4%. The Teichenné family’s history of distilling dates back to 19th Century Massat, on the French side of the Pyrenees. In search of fertile farming and the best low land fruit, they moved further down the mountain, settling in the Montpellier vineyards, where they began to source ingredients for distilling. And this provenance is something that echoes through the range today. The range combines the finest Mediterranean fruits to deliver a truly unique flavour extraction with outstanding mixability, along with melted glacial water from the Pyrenees that descends 100 miles down the mountain range before being drawn for today’s unique portfolio. 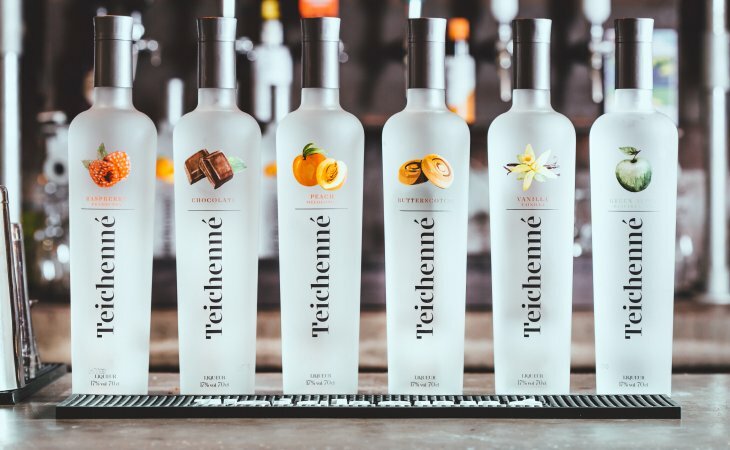 The Teichenné family have a history dating back to the 19th Century and their distilling experience has resulted in a high-quality range of liqueurs for today’s market. Combined with finest Mediterranean fruits and water from the Pyrenees, Teichenné delivers a truly unique flavour extraction with outstanding versatility. Teichenné is an entirely natural flavoured liqueur with a stunning array of flavours, perfect to complete any exceptional bar selection. Butterscotch: Well balanced sweet caramel with creamy toffee finish. Strawberry: The burst of summer fruits and creamy texture is preceded by the initial sweet bite. Peach: Soft peach melba sundae with a hint of sharp nectarine sorbet. Raspberry: Raspberry jam nose with a creamy raspberry cheesecake topping. Established in 1997, Global Brands has established a portfolio of 17 brands for every occasion spanning premium tonics, mixers and soft drinks, spirits and liqueurs, beers, RTS cocktails and RTDs. The company was founded by entrepreneur Steve Perez, who still runs the independent company today. In the UK off trade, Global Brands’ drinks are stocked by the majority of the country’s major multiple grocery retailers, convenience stores, premium retailers, and cash and carries. The company is also a leading supplier of drinks to the UK on trade, with its drinks sold in many of the UK’s major high street bar chains, hotel operators, late night venues and large regional brewers. Looking beyond the UK, Global Brands’ drinks are sold in 57 countries around the globe. The company prides itself on market-leading innovation. In 2015, it launched a range of premium quality tonics, mixers and soft drinks, Franklin & Sons. These are now sold in 35 countries globally. In 2017, the company evolved the RTD category to create a new offer of alcoholic soda, the Crooked Beverage Co, which is made using real fruit juice and no artificial sweeteners or flavours to provide consumers with an alternative to fruit ciders and craft beers.